Ganesha, the Lord of auspicious beginnings is indubitably the most cheerful god in the Hindu Pantheon.Short, rotund and pot-bellied with an elephants head, he is regarded as the governing deity of intellect and wisdom. Hindus the world over celebrate his 'birthday' . I'm incapable of explaining the details of the significance of this delightful god, so I'm just going to direct you to this link from Dr. Devdutt Pattanaiks website. Ganesha is depicted as holding a bowl of 'modaks' in his left hand. These sweet confections resemble little bags of money. These modaks are basically a sweet filling with either a fried wrapping made out of wheat flour or a steamed variety with a covering made of rice flour dough. The word modak is thought to be a corruption of the Sanskrit Madhu golaka (Madhu- sweet/ honey; golaka: sphere / ball). Getting ready to make the steamed version always induced a low level anxiety in my mother every year. She used to say that the lord's mood determined if the modaks (or kozhakattai, as they are known in Tamil) would emerge perfectly steamed or turned out to be a disintegrated mess. The solution: always make a tiny 'Ganesha' by pinching a bit of dough between the thumb, index and middle finger. The toughest part of making the modak is getting the rice flour dough right. too much water and the dough does not wrap itself well around the filling, too little and the skin cracks up while steaming. The modaks invariably are made in odd numbers, usually 11, 21 and usually the amount of rice flour made far exceeds the amount of filling. The remaining dough is then seasoned with mustard, asafetida, chile and curry leaf. 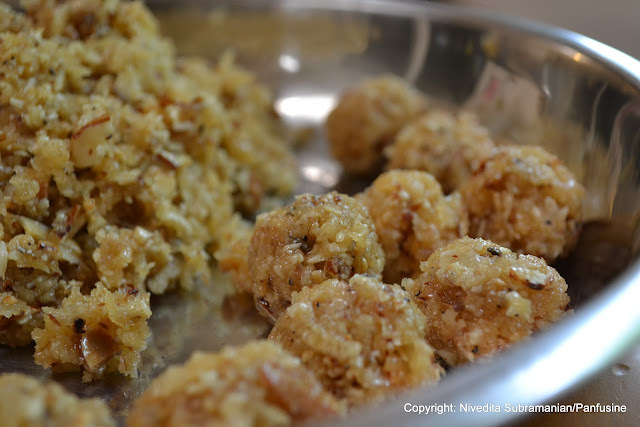 The mix is 'pinched' off into tiny bits and then steamed to make what are known as 'ammini' or 'mani' kozhakattai. These tiny morsels are highly addictive, don't know why, they just are! Combine the water and the crushed jaggery in a glass bowl and microwave for one minute till the jaggery dissolves. Transfer into a skillet along with the coconut and almonds. Cook down until the moisture evaporates, but before the sugar hardens. Stir in the cardamom and remove from heat. Set aside to cool. Roll into small 1/2 inch spheres. Soak the Urad dal for an hour in hot water. Drain the water, combine the dal with the chile, asafetida, salt and curry leaves. Grind into a semi-smooth batter . Heat oil in a non stick skillet, add the mustard seeds. when they sputter, add the urad dal batter and over low heat, stir the mixture until the moisture evaporates and the dal resembles large crumbs. remove from heat and allow to cool. shape into oblongs about an inch long. Sift the rice flour with the salt into a large & deep mixing bowl. 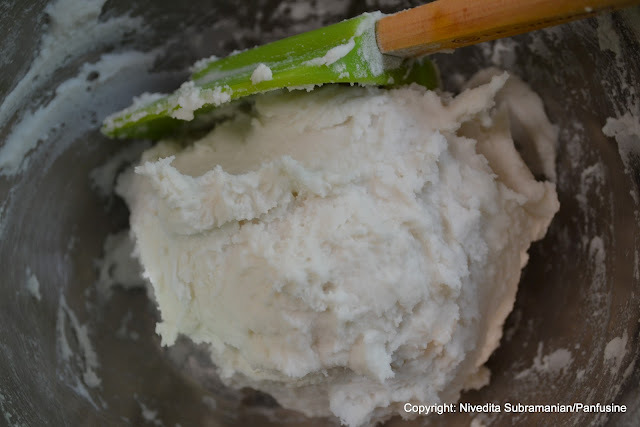 mixing the dough by hand is excruciatingly painful, not to mention the very high possibility of obtaining a lumpy ball of dough that is terrible to shape. I found this fool proof technique to eliminate lumps and the occasional dislocated shoulder. *Drumrolls*. A Kitchenaid Hand mixer.. , yes the kind you use to whip eggs for a cake (except this operation uses the dough hooks). Fit a hand mixer with the dough hook attachment. 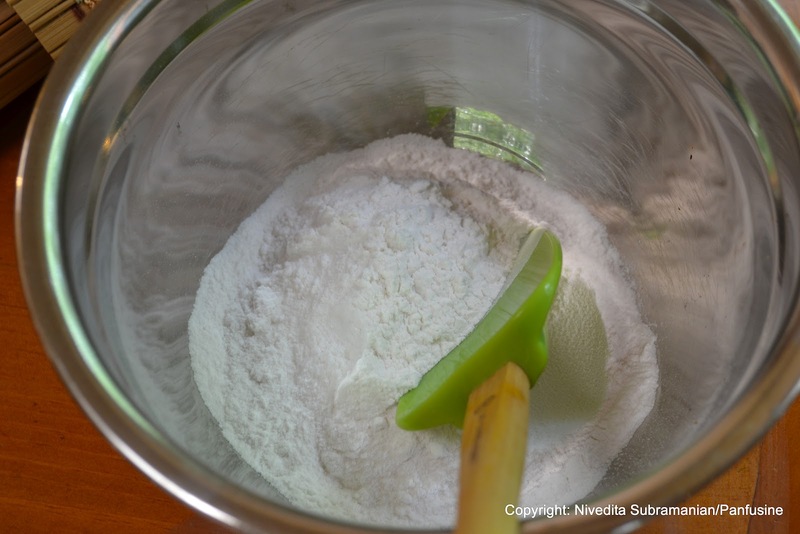 With the mixer set at a low speed, slowly add 1 cup of the boiling water into the rice flour mixing it simultaneously. Add the milk gradually. The mix should now come together into a pliable ball of dough. If its still crumbly, add the remaining water teaspoon by teaspoon with the mixer running until it comes together. To assemble the modaks, grease your fingertips and your left palm liberally with oil. Pinch off a dollop of dough, roll into a sphere and gently rub the dough with the oiled fingertips into forming a thin 2 inch circle. place the filling in the center of the flattened dough, and gently fold the edges of the rice flour 'skin' to completely cover the filling. pinch the top of the modak to form a peak. remove any extra bits and mix with the remaining dough. Set aside and repeat until the filling is finished. For the urad dal fillings the dough is wrapped over the filling to obtain a semicircular shape. Pinch the circumference of the semicircle to seal. Heat about an 1/2 inch of water in a large pan (wide enough to fit a steamer). Gently place the modaks on the steamer and steam them for 15 minutes. Remove from the steamer onto a plate, allow to cool slightly before tucking in. Heat a tablespoon of oil, add a teaspoon of mustard seeds (allow to sputter), salt and your choice of seasonings ad add them into any remaing dough. Fold in to combine. pinch of teeny bits with your fingers and gently place them on the steaming tray. Steam for 10 minutes until the dough 'firms up'. Bon appetit! Here's wishing everyone auspicious & lucky new beginnings in whatever you're planning to do! I've never had the savory version! Happiness and success to you, too! Happy festivities to you. Loved your DIY Ganesha. Ganpati Bappa Morya! Mangal Murti Morya! Enjoy the festival Niv. Thanks Anjali, and wish you the same! Ganpati Bappa Morya Niv to you and fly. may bappa bless you with his wealth and wisdom. I made modaks yesterday, today made sheera. My mom made one sweet for the 5 days we had Ganpati. I try but guess our moms always fretted with anxiety before big days. Love your version, next time will try adding milk to water. Wow Ashwini.. awesome yaar.. I 'm not even going to try doing the level of intensity that my mom did.. 10 days pooja & corresponding neivedhyam! My first time here, Niv. Lovely blog. Just something that caught my attention... I saw a label for this post saying vegan when the modak covering has milk. Thanks Raaga for pointing it out.. Its perfectly OK to omit milk and substitute water or almond milk. (the milk tends to bind the dough better (a cute little 'hack' I learnt from my mom to eliminate the issue of the dough 'splitting'), but isn't crucial to the recipe in terms of taste..) I just made the change. 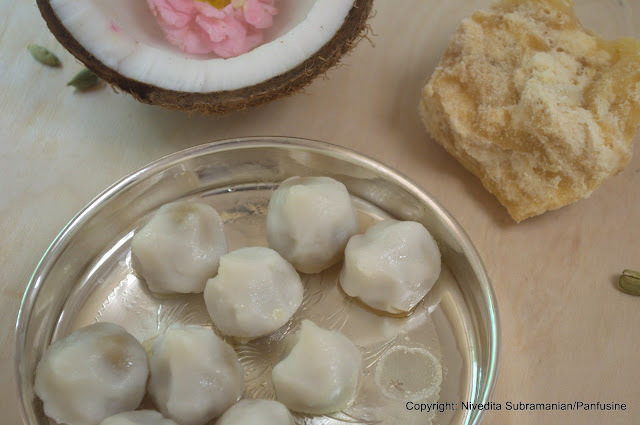 Thanks again for pointing it out..
Niv - going to try the modaks for varalakshmi nombu this year:) The milk trick sounds amazing as I usually end up with cracked modaks. Quick question - with your measures how many sweet and savory modaks will I get? I'd like to make enough for about 20 people so looking to make at least 20-30 of each. Let me know. 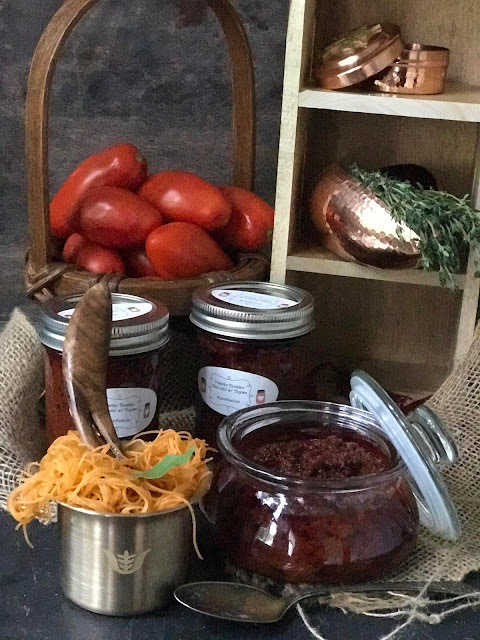 My own little Tomatina fest..